I got the same error message (Couldn't find developer disk image) after I updated my devices to iOS 9.2, but forgot to update to Xcode 7.2. So in my case, the fix was easy: just update to Xcode 7.2 via Mac App Store. I saw that there was a public beta for Xcode, so I installed it. One of the new features is that you don't need to have a Developer Program Account Dingus to upload your app directly to your iPhone. However, on my iPhone 4s, I also did a public beta update to iOS 8.4, problem being, that there's no Developer Disk Image available for it. Where do I to find it or how can it be fixed? This problem is a mismatch of your iOS version and Xcode version. You have an iPhone with iOS 9.3 GM and your Xcode version is 7.2.1. This leads to the issue that you have to update your Xcode to 7.3 which includes SDKs and related stuff for iOS 9.3. It works, in my case for Xcode from 7.3 TO 7.1. Copy directory 9.2, for iOS device OS 9.2.1. When you will reopen Xcode 7 and choose your device, there will be an error message; just click on fix issue and that should do it! This message appears when your version of Xcode is too old for the device's version of iOS. Upgrade Xcode to the latest. If the App Store doesn't offer an update for Xcode, upgrade to the latest Mac OS. In the past, Apple has been rather aggressive about dropping support for past versions of Mac OS X in the latest Xcode. EDIT: yes, this error started popping up all over again. :) Xcode 7.3.1, which is the latest one that's available for MacOS 10.11 (El Capitan), doesn't support iOS 10. You need MacOS Sierra (and possibly a new Mac). sudo ln -s "/Applications/Xcode9.app/Contents/Developer/Platforms/iPhoneOS.platform/DeviceSupport/11.0\ \(15A5278f\)" "/Applications/Xcode.app/Contents/Developer/Platforms/iPhoneOS.platform/DeviceSupport"
For people who would have similar problems in the future, beware that this problem is fundamentally rooted in the mismatch of your iOS version and Xcode version. Check the compatibility of iOS and Xcode. I am facing the same issue on Xcode 7.3 or Older version of your Xcode and my device version is iOS 10 or newer version of your OS. This error is shown when your Xcode is old and the related device you are using is updated to latest version. First of all, download the latest Xcode Version. No Need to install the latest Xcode. Right click on Xcode 8 or Newer version of your Xcode, select "Show Package Contents", "Contents", "Developer", "Platforms", "iPhoneOS.Platform", "Device Support"
Copy the 10.0 folder (or above for later version). Right click on Xcode 7.3 or version of your Xcode, now select "Show Package Contents", "Contents", "Developer", "Platforms", "iPhoneOS.Platform", "Device Support"
Paste the 10.0 folder (or above for later version). Now your Xcode has a new developer disk image. Close the finder now, and quit your Xcode. Open your Xcode and the error will be gone. Now you can connect your latest device to old Xcode versions. Thanks to @Hailei for their answer. So that people can download the latest DMGs. I have also faced this issue, and I'm on Xcode 7.2. It appeared when I downloaded iOS 9.3. Check your Project -> Base SDK and if it isn't the same or ahead of your device version, then that's the issue. I didn't see anything in the "Updates" section, but when I searched "Xcode" in the App Store it had an update for 7.3. Upgrading to iOS 9.3 and Xcode 7.3 requires Mac OS X v10.11 (El Capitan) for Xcode to run, and that's why auto update isn't upgrading Xcode versions. This was tested using Xcode 7.3 (std from Store) AND iPhone 6Plus with 10.0 (14A5261v). My Xcode version was 7.0.1, and I updated my iPhone's version to 9.2, and upon using Xcode I ran into this problem. The solution is pretty simple: Just download the latest version of Xcode 7.2 which was released on 8 Dec, 2015 and install it. Everything works fine for you as it was before. Note: The actual problem is your Xcode version is not compatible/outdated with the version on your device. There actually is a way to deploy to a device running a newer iOS that the particular version of Xcode might not actually support. What you need to do is copy over the folder that contains the Developer Disk Image from the newer version of Xcode. From here, copy over the folder that contains the version you are trying to run on the older version of Xcode (for this example, it's 9.3 with the build number in parenthesis). Copy this folder over to the other install of Xcode, and now you should be able to deploy to a device running that particular version of iOS. This will fail, however, if you're utilizing API calls that were specifically added to the newer version of the SDK. In that case, you will be forced to update Xcode. This error is shown when your Xcode installation is too old and the related device you are using is updated to latest version. There are multiple ways to solve this issues. 1. Update your Xcode installation. This is by far the simplest method. Just update your Xcode installation to the latest stable version and things would start working again. 2. Manually copying Device Disk Image. No update needed. This is the clever way around. You don't have to update your Xcode installation or your OS for this. First open the XCode.dmg and select Show Package Contents. Phase 1: Getting the downloaded Xcode ready. Download the latest Xcode.dmg from Developer portal. Select the downloaded Xcode.dmg and right click on it. In the options, select Open With → DiskImageMounter. Now in Finder, open the Xcode disk. In the disk, right click on Xcode. Now, a new finder window opens. Follow the instructions below to copy the disk image. Phase 2: Copying the Developer Disk Image. In the new finder, go to Contents. Inside Contents, Go to Developer. Inside Developer, go to Platform. Now select the desired platform. For our purpose, we are going to update iOS disk image only. Inside Platform, go to Device Support. Inside Device Support, you'll find a lot of disk images. This includes the latest device disk images as well. Copy all the folders inside Device Support. Select all and then copy. Note: For step 6, You can copy the disk image you want to copy as well, i.e. copy the latest only. It's the last folder in the hierarchy here. This ends the Phase 2, Copying the disk image. Now in the next phase, we will update the developer disk image of our Xcode installed on our device. Phase 3: Upadting the Xcode's developer disk image. Now, close all the finder windows for faster operation and less confusion. We are now going to update our Xcode's disk image for iOS Platform. Close the Xcode application if it is open. Select the primary partition if you have multiple partitions. Find XCode and right click on it. Finder window updates or opens a new window with Contents as the main directory. Inside iPhoneOS.platform, go to Device Support. Inside Device Support, select all the files and Move to Trash. Note: SKIP step 12 if you copied only the latest disk image i.e. the last folder in the hierarchy. Now, Paste the developer disk image we copied from Phase 2 here. Final Step, right click and Paste here. If everything worked properly, your Xcode has new developer disk image. Close the finder now, and open Xcode. The error should be gone by now. Reminder: Don't forget to unmount the Xcode now from finder as well. This happens when your Xcode version doesn't have a necessary component to build the application to your target OS. You should update your Xcode. If you are building a new application for a beta OS version that no stable Xcode version is able to build, you should download the newest Xcode beta version. Just like @onmyway133 answer, but more user-friendly is after finish installing the Xcode 8-beta version, go to Xcode 7.3 preferences (Cmd + ,), go to the tab locations, change the Command Line Tools to Xcode 8 in the dropdown list. 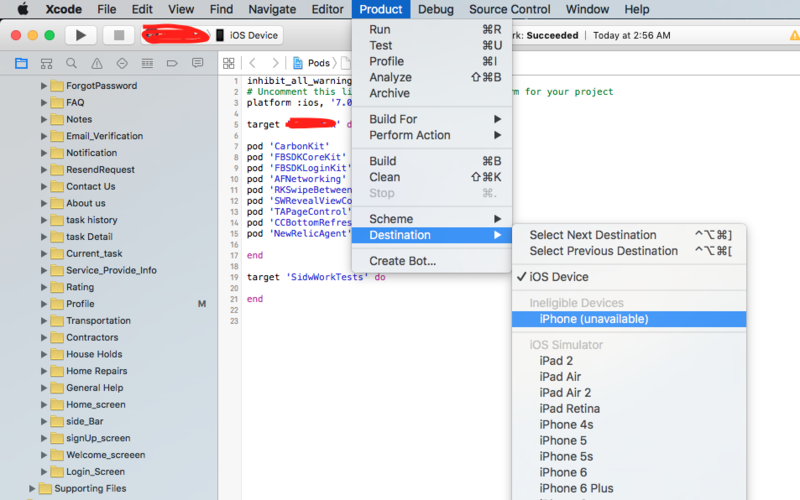 I successfully built to both iOS simulator 9.3 and my device iOS 10 beta using Xcode 7.3. My problem was with Xcode 7 and Xcode 6.4 beta and iOS 8.4 - device not compatible. and works with my iPhone 7plus with new iOS 11 beta. I just got this, and I'm on Xcode 7.2.1... It appeared when I downloaded iOS 9.3. Check your Project -> Base SDK and if it isn't the same or ahead of your device version, then that's the issue. I didn't see anything in the "Updates" section, but when I searched "Xcode" in the App Store it had an update for 7.3. Upgrading to iOS 9.3 and Xcode 7.3 requires Mac OS X v10.11 (El Capitan) for Xcode to run, and that's why auto update isn't upgrading Xcode versions. As others suggested, this issue is caused by an incompatible iOS version (which is higher than the maximum version that Xcode supports). Normally it can be addressed by updating Xcode, but sometimes you may be restricted to do so, hence here's another workaround. Head to developer.apple.com/downloads (or google similar stuff if this link dies) to grab the newest Xcode dmg image manually, and then mount it. If you're doing this already, the new Xcode is not likely working for you, but you can cp /Volumes/Xcode/Xcode.app/Contents/Developer/Platforms/iPhoneOS.platform/DeviceSupport/NEW_IOS_VERSION /Applications/Xcode.app/Contents/Developer/Platforms/iPhoneOS.platform/DeviceSupport/ to copy the image you want into the old Xcode you've installed. Of course it's not guaranteed to work for future versions, but it's definitely worth trying. For me, my iOS version is 9.3.1 (13E238), but I copied 9.3 (13E230), and it works just fine. Solution) Then finally i downloaded latest version of Xcode version 9.2 from https://developer.apple.com/downloads/ and everything worked fine for me. 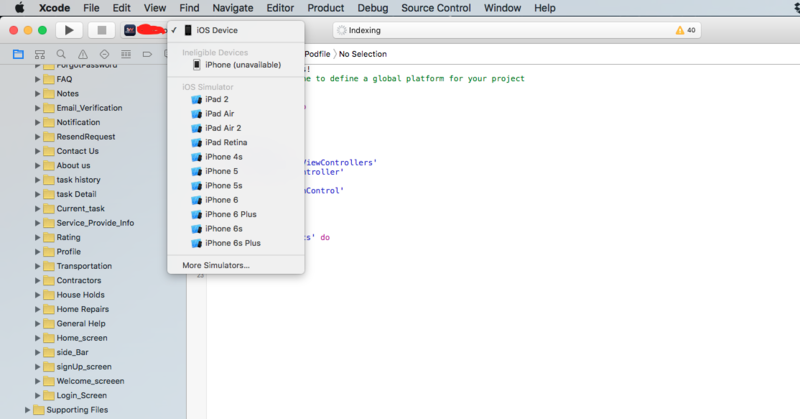 instantiateViewControllerWithIdentifier, but where is the identifier in xCode 4.5? Is it normal that lazy var property is initialized twice? What is the difference between outlet connection and action connection?